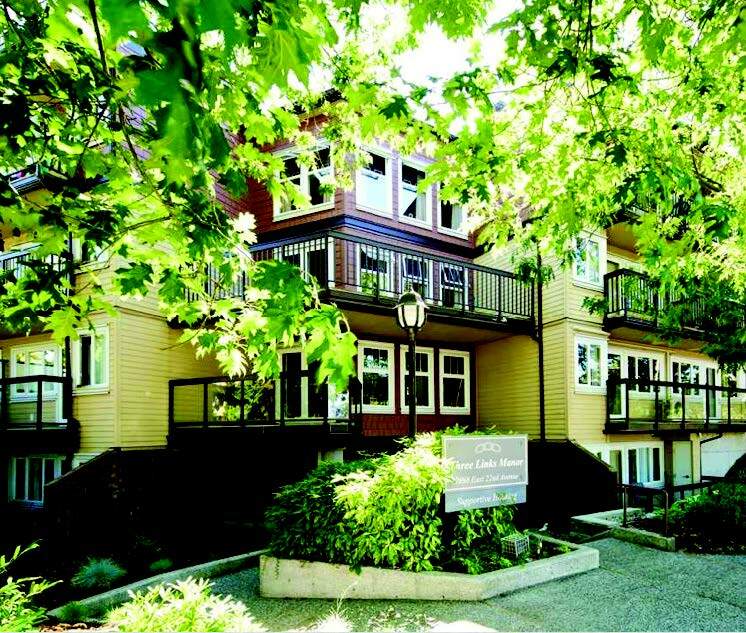 Three Links provides residential care and independent living services to 175 residents in Vancouver’s Renfrew-Collingwood neighbourhood and creates job opportunities for more than 100 staff, service providers and contractors. 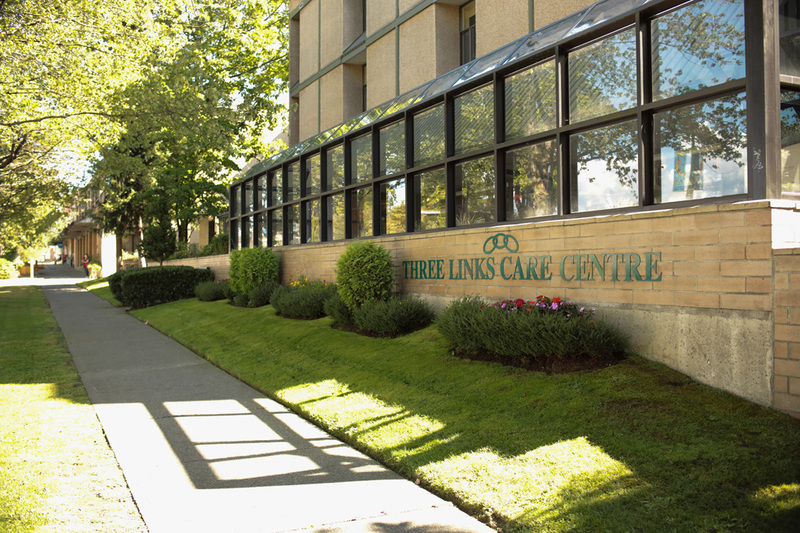 Three Links continues to operate a 90-bed residential Care Centre in partnership with Vancouver Coastal Health (VCH). In 2016-17, the Society received $5.3 million from VCH to provide a range of complex seniors’ care services. Three Links continues to operate 39 independent living units at the Three Links Manor with annual support from BC Housing totalling $113,000. administer a lease with the Renfrew-Collingwood Seniors Society that provides space within the Care Centre to operate an adult day care program for neighbourhood seniors. Three Links operates within the framework established by the BC Societies Act and is led by a volunteer Board of Directors with expertise in health care management, law, financial administration, community engagement, human resources and information technology. 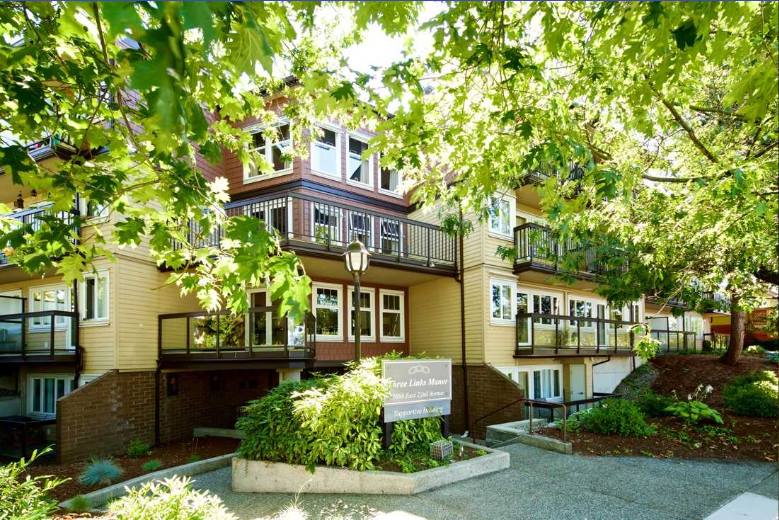 Of the 40 residents at the Manor, 36 have rent at 90% of market value and 34 receive support from BC Housing. Two receive no additional support. Four Manor residents receive Ministry assistance, support from BC Housing and/or a Three Links subsidy. Their monthly rent is $332. Six of the 39 Manor units are one bedroom. One is home to two people. Our Three Links Care Centre is home to residents with long-term, complex care needs. This fully accredited and licensed property features 90 private bedrooms with 2 piece ensuites, divided into three separate communities – each with its own nursing station providing 24-hour care. Whiting Place, the original building of the Care Centre built in 1982, offers complex care with 50 private bedrooms with their own bathrooms. There are both private and communal lounges, with dining in the Main Floor dining area. Residents can enjoy views of Renfrew Park and the North Shore mountains in the two bright outdoor patios with secured perimeters. Therapeutic recreation programs are offered on the main floor. Opened as part of the Care Centre expansion in 2000, Rebekah Place provides a calm and safe haven for persons with varying forms of dementia and responsive behaviours. This secured unit features 20 private bedrooms/2 piece ensuites with a secured outdoor area for residents to enjoy fresh air and views of Renfrew Park and the North Shore mountains. Therapeutic recreation activities complement the services we provide. Opened as part of the Care Centre expansion in 2000, Kinney Place is another complex care unit, which features 20 private bedrooms/2 piece ensuites, a nicely appointed communal lounge and a spacious dining room. This unit is also home to our two house cats. Therapeutic recreation is available in the Kinney Place Unit, as well as on Centre’s main floor. See below for more details, or download our Welcome Package or visit our Family Resources page. We provide a wide range of health care services (non-acute) and other important services, and ensure our residents have full access to recreational and social activities. Care services are provided on a 24-hour basis by a team of professional staff, which includes Registered Nurses, Registered Psychiatric Nurses and Licensed Practical Nurses. A Clinical Dietitian, Social Worker, Spiritual Care Coordinator and Music Therapist are available during business hours several days a week. Medical services are provided by both House Physicians and General Practitioners from the community. Resident Care Aides, Rehabilitation Assistant and Recreational Aides complete our team of dedicated staff members. As mentioned above, each of our three care units provide additional, specialized support and care services. For Three Links Care Centre residents without a family doctor, there are house physicians who regularly visit the Centre and are willing to accept new patients. For Three Links Care Centre residents without a family doctor, there are house physicians who regularly visit the Centre and are willing to accept new patients. Residents wishing to continue with the services of their personal doctor are encouraged to do so. Prior to admission, the resident and his or her doctor should discuss the kinds of medical care the resident is comfortable with. Residents’ wishes will be noted on their medical records. When residents are admitted, we request they appoint a family member or close friend to be their health care advocate. In the event that a resident is unable to discuss treatment decisions with their physician, the health care advocate will be able to speak for the resident. Additional health care services provided through Vancouver Coastal Health at their Evergreen Health Unit include: Occupational Therapy, Physiotherapy and Speech Language Pathology. For the residents at Three Links Care Centre, nutritious and appetizing meals are freshly prepared in our kitchen and served three times a day. For the residents at Three Links Care Centre, nutritious and appetizing meals are freshly prepared in our kitchen and served three times a day (breakfast, lunch and dinner), restaurant style, in our spacious dining rooms. Meals are appetizing and attractive and meet the Canada Food Guidelines for quality and nutritional content. We have a “sleep in” program with hot breakfast served until 10 o’clock each morning and continental breakfast after 10 o’ clock. There are also two tea times held on each unit daily (mid-afternoon and mid-evening), which provide residents with social time accompanied by in-house baked goods and refreshments. If residents wish to enjoy a private meal with friends or family they may book the Private Family Dining Room at the Front Desk, or by dialing 604-434-7211 ext. 500. With the goal of providing optimal nutrition to meet each resident’s nutritional needs, our in-house dietitian is responsible for determining the nutritional status of all residents and developing an individualized nutritional care plan for each resident. Our Dietitian will meet with new residents to discuss food preferences, allergies or any special requests. We encourage friends and families to join Care Centre residents at mealtime in either the Main Floor Dining Area, Activity Room or the Private Dining Room. The cost is reasonable and we ask you to contact us at 604-434-7211, ext. 500 before 10:30 a.m. for lunch, and before 2:00 p.m. for dinner. To join us for weekend meals, please purchase tickets from Front Reception, Monday through Friday between 9:30 a.m. to 2:00 p.m. If residents wish to enjoy a private meal with friends or family they may book the Private Family Dining Room at Front Reception, or by dialing 604-434-7211, ext. 500. A Social Worker is available 2-3 days a week at Three Links Care Centre. The Social Worker is able to assist Care Centre residents and their families with a variety of issues. A Social Worker is available 2-3 days a week at Three Links Care Centre. The Social Worker is able to assist Care Centre residents and their families with a variety of issues, including admission and discharge planning, financial concerns and psychosocial issues. The Spiritual Care Coordinator visits Three Links Care Centre twice a week and responds to residents’ spiritual needs, and may provide support to families, especially for residents in palliative care. At Three Links, we understand the importance of recreation and leisure in our residents’ lives. At Three Links, we understand the importance of recreation and leisure in our residents’ lives. The Recreation Department at Three Links Care Centre ensures all residents are offered appropriate and fulfilling daily activities, which encourage socialization, growth and achievement. Led by a Therapeutic Recreation Team Leader who coordinates the daily recreation activities and special events for the Whiting, Rebekah and Kinney units at the Care Centre, activity workers and volunteers carry out a full array of programs with residents in all three levels of care. These activities range from therapeutic programs such as painting and music appreciation to entertaining activities such as bingo and word games. On a monthly basis, we also offer outings, which encourage our residents to get out in the community for shopping, or other community visits and tours. A customized bus for residents is used for these outings. Our monthly newsletter is located in the front lobby area and activities are posted on the resident notice board in the main hallway at the Care Centre. Activities may include: Bingo, Bowling, Hand Massage, Manicures, Parlor Games, Baking, Tai Chi, Exercise Programs, Sing-Alongs, Hand Chime Choir, and more! Three Links Care Centre is fortunate to have other specialists visit the Centre to provide additional services to our residents that we are unable to provide in-house. We encourage Care Centre residents to have an oral examination once a year. Our nursing staff can book dental appointments through our mobile dental hygienist, Silver Valet Dental services, or a dental office as designated by the resident or their family. We also have access to a mobile Denturist whose services can be arranged through our nursing staff. Please note – Dental costs are not covered by Three Links Care Centre and are the responsibility of the resident and/or their family. We recommend that our Care Centre residents have their eyes checked every one to two years. Residents who have ongoing eye problems may need to have their eyes examined once a year, or more frequently. Optometry appointments may be made through our nursing staff. Consent forms will need to be completed by either the resident or their designated decision maker. Costs associated with optometry services are partially covered by the Medical Services Plan of BC. Any additional costs are the responsibility of the resident and/or their family. A podiatrist visits the Care Centre on a regular basis and appointments can be arranged through the nursing staff. Residents are encouraged to see the podiatrist every six weeks. Podiatry services are no longer covered by the Medical Services Plan of BC and costs are the responsibility of the resident. Appointment fees range from $17 to $40, depending on the resident’s medical or extended health plan. Hairdressing and barber services are available for Care Centre residents in the Hair Salon on each unit. Appointments for a haircut, perm, or hair set can be made through the nursing staff on each unit. The hairdresser visits Three Links Care Centre on Mondays (Whiting Unit) and Thursdays (Kinney and Rebekah Unit). Payment is made through the resident’s trust account. A form is given to each resident/financial designate to complete at the time of admission. This form indicates consent for hairdresser services/barber services. These forms can be picked up at Front Reception. Three Links Care Centre provides full laundry, housekeeping, dietary and maintenance services on site at no extra cost to our residents. Laundry includes laundering of all linens, towels, bedding and residents’ personal clothing. We suggest a minimum wardrobe of four complete changes of clothing plus garments for special occasions. Shoes should be chosen with care to ensure that they are comfortable, provide proper support, and are safe. If you wish, your family or friends may continue to do your laundry at home. Please inform the nursing staff. Clothing must be machine washable and of a no-iron fabric. In order to avoid the possibility of loss, all items will be marked by the Centre when the resident arrives. Please remember to give all new clothing to the nursing staff so that they can be sent to laundry for labelling. All resident rooms and public areas are cleaned on a regular basis. Housekeeping services include dusting, vacuuming, mopping and making the beds, as well as thorough cleaning of all washrooms. All meals are freshly prepared on site by our kitchen staff and served directly to the residents. Meals are served 3 times a day, along with 2 snacks and any required nutritional supplements as set out by the resident’s care plan. Residents’ nutritional requirements are assessed by our Dietitian and these needs are taken into consideration by the dietary staff when meals are made for each of our residents. Maintenance workers are on site everyday during business hours to ensure our facility is safe and in good working order for residents, staff, volunteers and visitors alike. Any concerns regarding Support Services can be addressed with the Director of Support Services by calling 778-452-6510. Each month we hold a ‘Family Event’ at Three Links Care Centre – families and friends of our residents are invited to join us for entertainment and birthday cake. Each month we hold a ‘Family Event’ at Three Links Care Centre – families and friends of our residents are invited to join us for entertainment and birthday cake. We also encourage families to take part in our Resident and Family Council and the Family Advisory Committee. Council/Committee meetings are held on a monthly basis and serve as a communication link between residents, residents’ families and staff. At meetings, residents/families are encouraged to share suggestions and feedback regarding activity programming, fundraising projects and quality of services experienced. To date these fundraising efforts have enabled residents to obtain many ‘extras’ for the Care Centre, including outdoor patio furniture, the fireplace in the main floor lounge and several additions to our leisure programs. Three Links Manor provides two different housing options for people over the age of 55 – low-rental independent living housing and supportive living suites. This fully accredited and licensed apartment complex features 39 bachelor and one-bedroom units, and 3 common area rooms. These apartments can be rented as part of independent, low-rental senior housing or with additional support services from Three Links Care Society. Through the Seniors Supportive Housing Program, we offer an inclusive support services package for seniors who require additional assistance in order to extend their ability to live independently. For more information about Three Links Manor see details below, or contact Housing Services by emailing info@threelinks.com or call 604-568-6895. Residents participating in the Supportive Housing program at the Manor receive a hot and nutritious meal every evening. Dinner is served in a beautiful dining room that encourages opportunity for socializing during dinner time. Independent residents can also take advantage of the incredible amenities, shops and restaurants a few steps away in the Renfrew-Collingwood neighbourhood of Vancouver. Our properties are bounded to the north and south by two beautiful parks and greenspaces, and we have a seniors centre right next door. The Renfrew Ravine Park is a nature sanctuary complete with creek and ravine and walking paths, and the Renfrew Community Park is a hub for the community, with amenities that include a public library, rec centre and indoor pool, and various outdoor recreation areas. Who can apply for housing at the Three Links Manor? The Seniors Supportive Housing program is especially beneficial for low-income seniors who are experiencing difficulty living independently but who are not eligible to participate in the Independent Living BC program or licensed complex care. • Require a modified physical environment and support services to assist them to “age in place”. • Not require a permanent level of support that exceeds the services available through SSH. • Be able to manage their own lifestyles, including reacting appropriately in an emergency situation. Note: Supportive Housing should not be confused with Assisted Living. Assisted Living provides the same services that Supportive Housing has, but also offers some nursing care and assistance with daily living activities. If you would like more assistance or information regarding Assisted Living in your community, contact the Vancouver Coastal Health Authority.